Council Member Jimmy Van Bramer is withholding support for protected bike lanes connecting Queens Boulevard and the Queensboro Bridge until the city addresses pedestrian safety concerns at P.S. 11 on Skillman Avenue between 54th Street and 55th Street. At issue are the unmarked pedestrian crossings by the school, which opened a new wing in the fall with an entrance on Skillman east of 54th Street. Skillman is a one-way street with two moving lanes at this location, conditions ripe for excessive car speeds, but there are no marked crossings or traffic control devices, and not much to calm traffic besides a painted bike lane. P.S. 11 PTA leader Mindy Bichler-Greene said school administrators first raised the issue with DOT in 2016, before the new wing opened. But a DOT presentation about the bike lane to the PTA last month didn’t address those concerns. On Friday, the PTA submitted a petition to DOT calling for “a crosswalk, stop sign or stop light” on Skillman east of 54th Street to connect the school and the library [PDF]. Bichler-Greene said they’ve picked up almost 1,000 signatures. 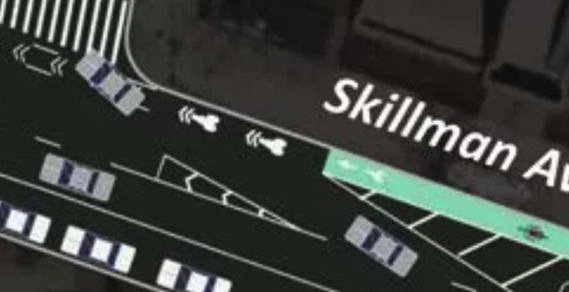 By narrowing Skillman to one motor vehicle moving lane, DOT’s plan for a protected bike lane would reduce excessive car speeds and improve the safety of pedestrian crossings. Traffic lights might make matters worse, since drivers often accelerate to “beat” yellow lights, but marked crosswalks with stop signs wouldn’t create that risk. 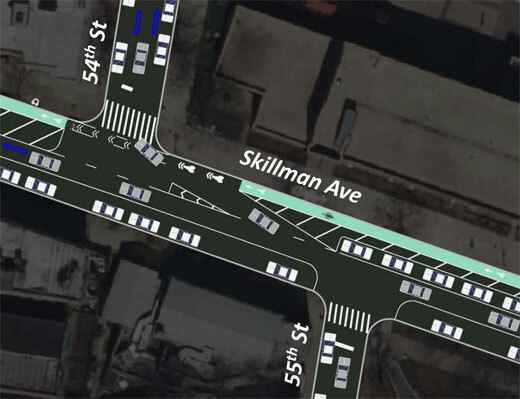 In April, Van Bramer called for protected bike lanes on Skillman Avenue and 43rd Avenue, its eastbound counterpart, but he says the absence of a crossing by the school is a deal breaker. Speaking to Streetsblog after the press conference, Van Bramer said DOT reps dropped the ball in their presentation to the PTA. The interests of the students of this school — and of all pedestrians in the area — can be served without compromising the bike lane. The DOT must listen to Van Bramer here. The agency should not be turing bicyclists’ allies into our enemies. I agree… a street improved for bikes and students is better than one improved just for bikes. Let’s all work together! And while we’re at it, let’s get rid of that horrible mixing zone. Change it into a right-turn pocket with a stop sign for the right-turn lane. That is not actually an unmarked crossing under NY law because it’s a T-intersection and the traffic on Skillman is uncontrolled so it’s technically illegal to cross there currently (same deal with all the intersections on 111th St). Hmm. That’s interesting. So this means that there can’t be a crosswalk there by law, right? Nothing to do with the DOT. But wasn’t there some kind of argument being made that the crosswalks that people wanted on 111th Street could not legally be installed? Or am I remembering that wrong? I’m okay with this. It’s a bit bareknuckled, but Van Bramer does want the bike lane. If I recall correctly, one of the issues on 111th St was that once DOT watered down the plan to retain 2 north-bound lanes, it no longer met DOT’s guidelines for “enhanced crosswalks” (marked crosswalks with warning signs, but no traffic light or stop sign), which say they should only be used to cross one lane of traffic (or maybe at most one lane in each direction). I think those guidelines are based on some federal guidelines. I’m not sure that doesn’t comply with federal design guidance is quite the same as legally prohibited as DOT has used all kinds of non-standard design elements in the past. So, then, we can say that tne DOT should accede to what Van Bramer is demanding. Yah, the good old, merge right into the pathway of the bikes. What about turning 54th St into a one-way SB street? Then the right turn pocket from Skillman to 54th St can be eliminated from the design, allowing for a crosswalk to be placed where the turn pocket would be in front of the library. Looking at the map, there shouldn’t be much of a traffic impact on turning 54th St/39th Dr into a one-way street, since 54th St/39th Dr together is essentially one curved link that begins and ends at T-intersections, with no intersecting links in between. Definitely looks like an important place to have a crosswalk. 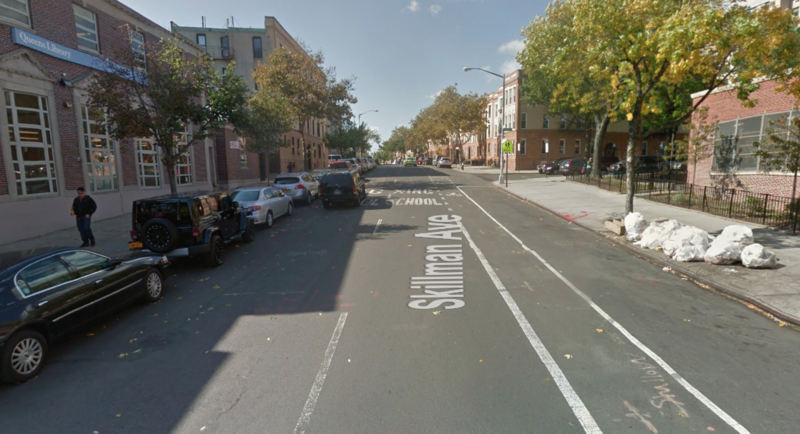 Council Member Jimmy Van Bramer insists he's working to advance the implementation of protected bike lanes on 43rd Avenue and Skillman Avenue in Sunnyside, but the process he envisions could delay the project indefinitely.